"Only those who wish to pray may enter". This sign in front of the Blessed Sacrament Chapel lets visitors know that this is a place for reflection, and not just part of a tour of the basilica. 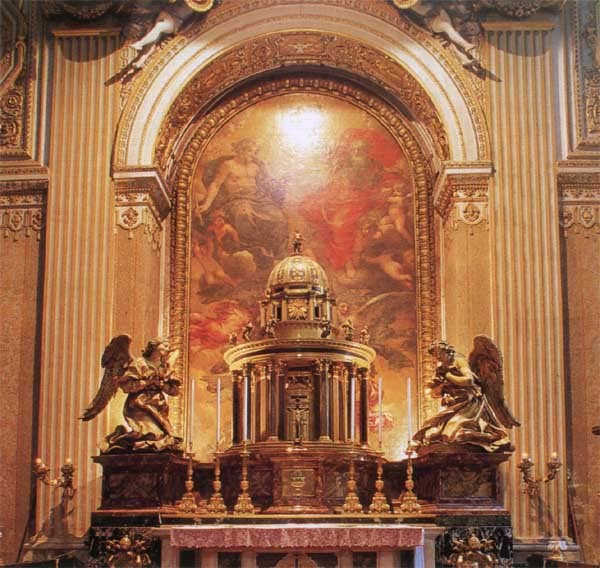 The Blessed Sacrament is exposed here in front of a beautiful tabernacle designed by Bernini. Also on the right is the vast Chapel of the Blessed Sacrament, behind a Baroque wrought-iron grill designed by Francesco Borromini (1599-1667). The Blessed Sacrament is exposed here for the continuous adoration of the faithful. A notice reads: "Only those who wish to pray may enter". The Eucharist is frequently celebrated in this chapel, with hymns and community prayers. In bygone ages, the faithful would pause in silent prayer and contemplation of Jesus, the living bread come down from heaven. This bread is the Body of the Lord for the life of the world. Whoever eats this bread will have eternal life. The decision to reserve this chapel for the Blessed Sacrament implied the greatest commitment to its decoration. This is why the faithful who admire its beauty and harmony feel encouraged to pray and to reflect here. The most precious work is the Tabernacle of gilded bronze, designed by Gian Lorenzo Bernini (1674) on the lines of the famous tempietto of St. Pietro in Montorio, the work of Bramante. Its charm is enhanced by the statuettes of the twelve Apostles on the cornice and of Jesus on the miniature dome. It is encrusted with deep blue lapis lazuli which stands out against the golden background and is flanked by tow o the loveliest angels in gilded bronze, kneeling in reverent prayer. Behind the altar is an altarpiece painted in oils by Pietro da Cortona (1596-1669) which celebrates the Trinity, God the Father, the Son make man who died for us, the Holy Spirit who guides the Church. 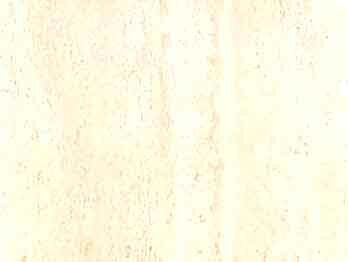 It is the only canvas in the whole basilica. The Apocalypse aflame and the Saints in adoration decorate the ceiling. In the spandrels are episodes from the Old Testament, prefiguring the Eucharist. The Eucharist is also the theme of the scenes in the lunettes. The mosaic covering the wall on the right was inspired by the Ecstasy of St. Francis by Domenichino. This is a silent chapel, filled with the scent of flowers and incense. Perhaps it is the most mystical in the entire basilica. The Blessed Sacrament is here for the faithful to see, and it is particularly awe-inspiring for Catholics. It brings to mind the words and melodies of the Lauda Sion Salvatorem, the Pange Lingua and the Adoro te devote, the great hymns written by St. Thomas Aquinas when he composed the Holy Office for the Feast of Corpus Christi. These hymns seem to develop in a joyous crescendo, following the harmonious lines and colors of the gilded stucco on the ceiling, the gaze of angels in mid-flight, and the slanting rays of light that gently illuminate the space. All this beauty helps the soul, as does the intimacy and silence of this place, the trusting dialogue of prayer which becomes a song of joy. 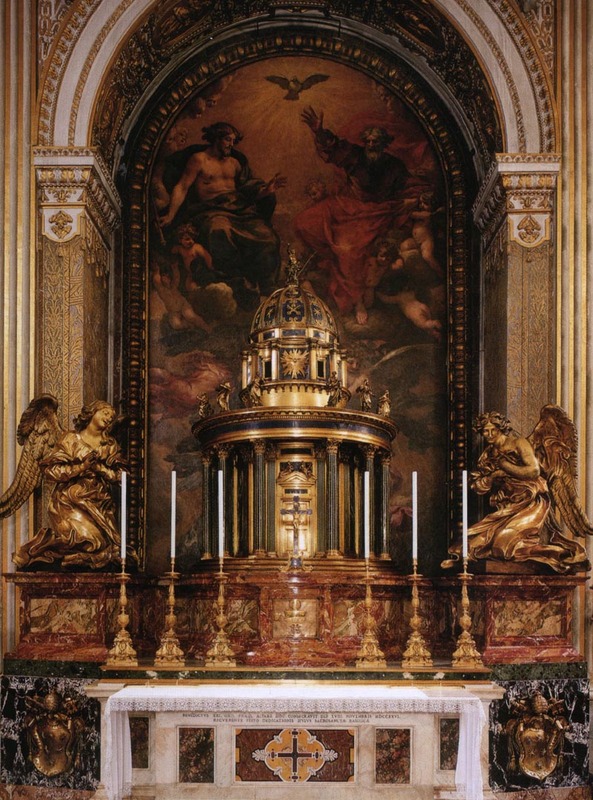 The tabernacle, by Bernini (1598-1680) is based on the famous Gianicolo temple by Bramante. The two large angels kneeling on the altar watch us, filled with joy and invite us to worship and pray, and to forget the deafening noise of the world for an instant or two. Mesmerized by all this, pilgrims and visitors alike can leave frivolity aside, and contemplate what is really important. The devout may kneel before Christ, their "Bread of Life" who brings the "word of eternal life." The splendid, solemn Holy Sacrament Chapel opens on the right. Visits to it are restricted to those who wish to pray. It is entered through an elegant iron gate decorated in bronze with the coat of arms of Pope Urban VIII, designed by Borromini. Defined by Turcio as "the very soul of the Basilica," it shines with the rich gilded stucco decorations, the work of Giacomo Perugino to drawings by Pietro da Cortona, made up of 29 bas-reliefs supported by small putti, showing symbols and characters from the Old and New Testaments. The four arches are adorned with allegorical statues representing Abundance, Faith, Sacrifice and Charity, which are crowned by 16 statues of angels, eight large ones in the tympanums and eight small ones in the corbels. The light penetrates radiantly from the small central cupola. 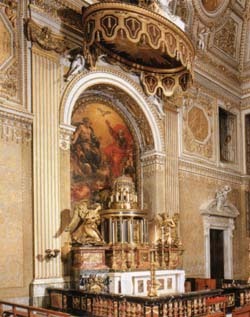 The focal center of the Chapel is the altar, enriched by precious marble with the arms of Clement X Altieri at the side from which rises the Ciborium by Bernini, who with it created a harmonious foretaste of monumental goldsmithing, with sparkling contrast between gold and silver and the dark blue of lapis lazuli. There is a clear revival of the 16th century style, directly inspired by Bramante's Tempietto di San Pietro in Montorio. It shows, however, the Baroque spirit in the upper decoration of the 12 statuettes of the apostles, plus the one of the Savior on the small cupola in clear Berninian style, which ennoble the whole structure of the work. 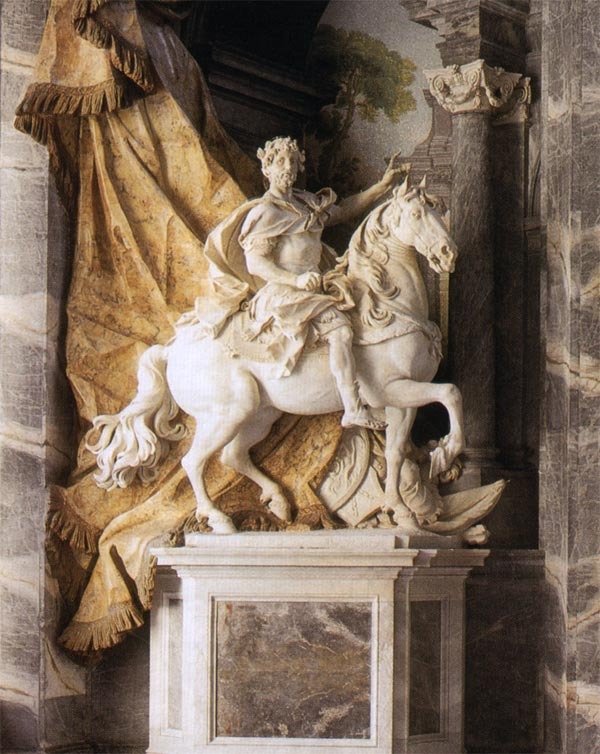 At the sides, two gilded bronze angels kneel, a motif dear to Bernini right from the beginning of his career, which here become two magnificent figures, at the same time light because of the wide looseness of their robes, the affected grace of their attitudes and the expressive ecstasy of their faces. This ecstasy seems more gently natural in the angel on the right, the work of the Master, while the other is the work of a helper. 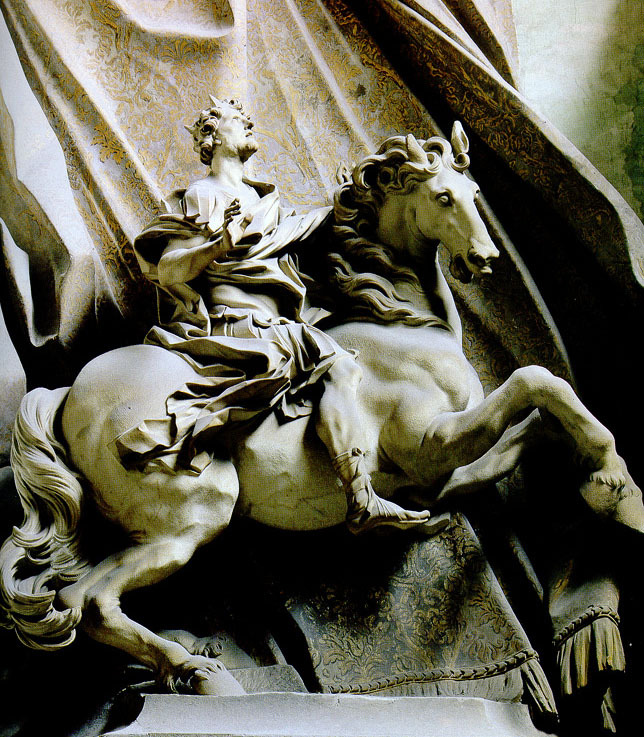 Bernini's preparatory sketches of both are, however, still in existence. Behind the altar, from 1628 to 1631, Berrettini painted the Holy Trinity on slate. It is a work in which the master, without foregoing the typical Baroque style, was able to express a dynamic composition, animated by many figures, but at the same time harmoniously intimate, an image strictly in line with the theological concept to be illustrated, so much so that it became a true iconographic model for this subject until the end of the 18th century. 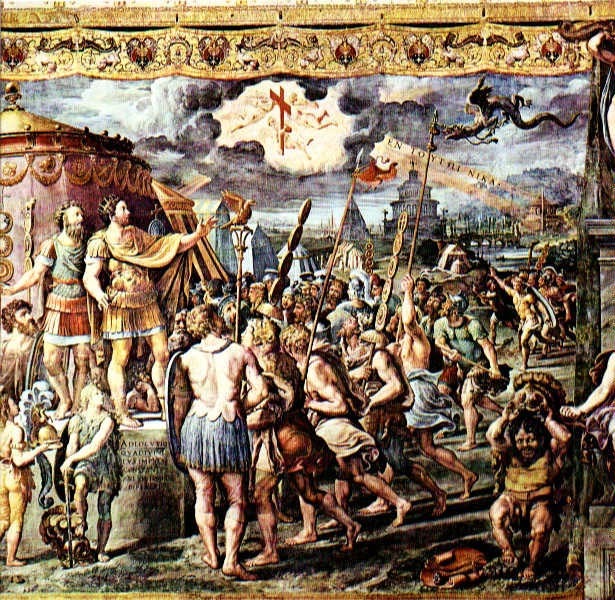 On the altar on the right is a mosaic copy of St. Francis receiving the stigmata by Domenichino, which is in the Church of the Cappuccines in Rome. At the sides are two spiral columns from the Oratory of St. Mark ad Praesepem, constructed by John VII at the beginning of the eighth century. Up until 1922, before the altar there was Sixtus IV's bronze Sepulcher transferred there in 1635 from the Sistine Choir and now housed in the Treasury Museum of the Basilica. 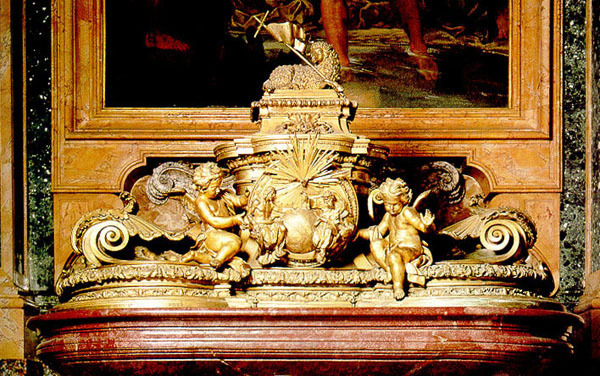 This magnificent funeral bed, terminated in 1495, is an absolute masterpiece of this kind of monument and is one of the most important ones by Antonio Benci, known as Pollaiolo, because of its superb, truly masterful sculpturing. 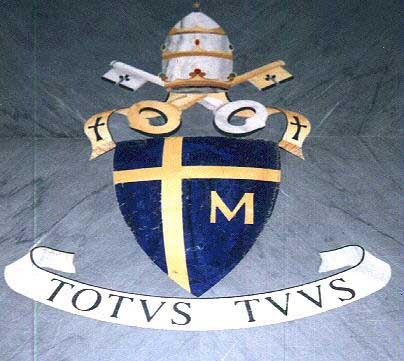 In it the Pope, a famous humanist and learned theologian, appears serenely relaxed, surrounded by the theological Virtues and cardinals, while the lower part shows the Arts and Sciences, of which he was an enlightened protector. 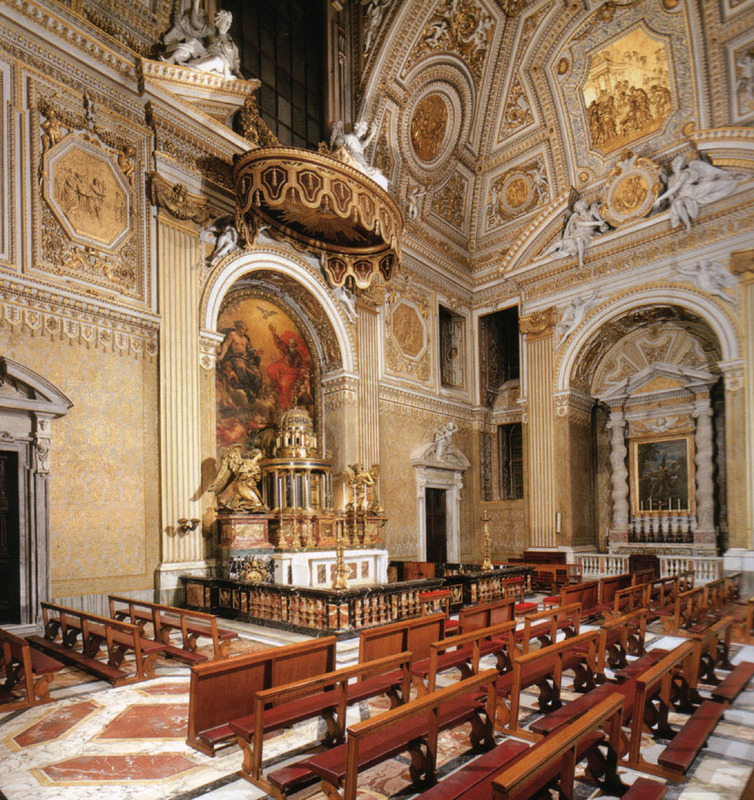 The rich furnishings of this Chapel are completed by the floor which Pius IX had re-laid with a fine mosaic inserted in the center and by the organ placed on the left, which was originally in the adjacent Gregorian Chapel and is based on an earlier model, created for Pope Gregory XIII, restored in 1914 by Morettini. 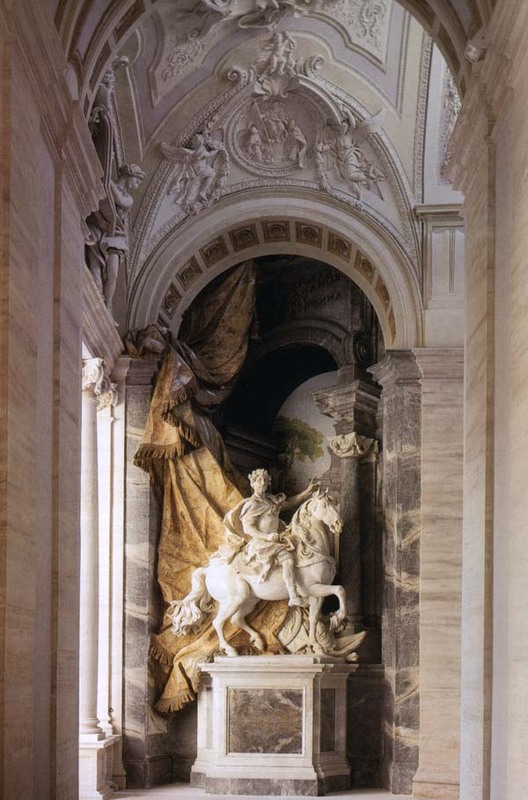 The door on the left of the altar connects with the Papal apartments, by means of a stairway which Pope Sixtus V had built. 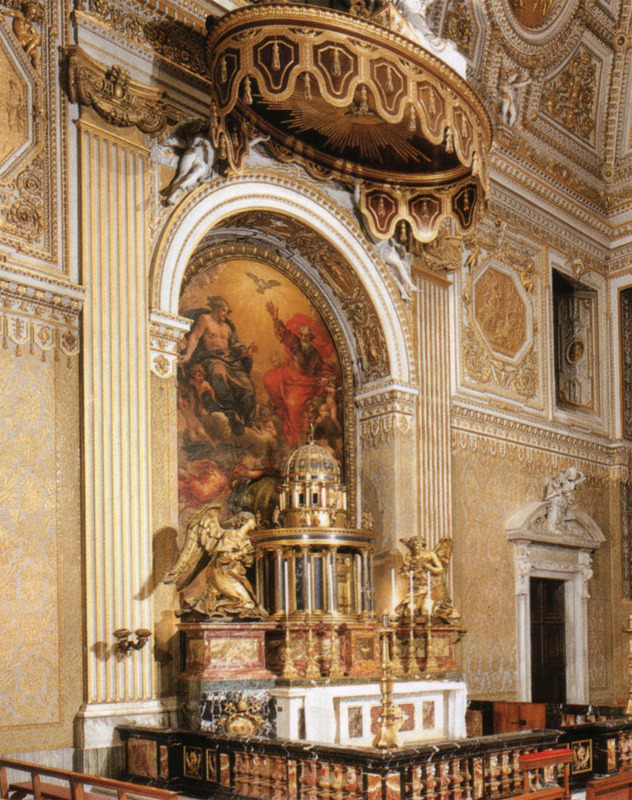 The Blessed Sacrament Chapel: Bernini's remarkable Ciborium, whose form derives from Bramante's famous tempietto at San Pietro in Montorio, was installed here to replace that of Baldassarre Peruzzi. It is of gilded bronze, skillfully enhanced by the contrast of the dark background and lapis lazuli. The two bronze angels which frame this wonderful composition within the arch of their curved wings are full of motion, despite their classic idealization. 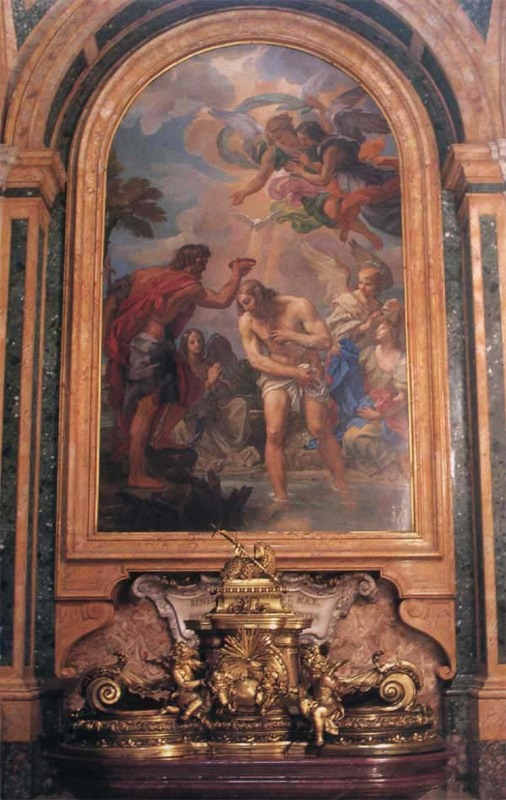 Behind the Ciborium is a fresco of the Trinity by Pietro da Cortona. Above the right-hand altar is a mosaic copy of the Ecstasy of Saint Francis by Domenichino; the original is in the Capuchin church in Via Veneto. Opposite is one of the oldest organs in the Basilica. The little cupola in front of the chapel was painted by Spadarino and Nicola Tornioli. This chapel was the original site of Pollaiolo's famous monument to Sixtus IV, now in the Historical and Artistic Museum of the Basilica, situated next to the Sacristy and opened in the Holy Year of 1975.